everything LEB: It's a Madhouse! It's crazy busy today in Boston and I'm right in the middle of it. No, I'm not running the marathon (I'm not that nutty) but I will be there cheering on the crazies, BBQin' and drinking! Have fun. Both my sisters went to BC and they love marathon monday. They have both already graduated, but I heard them complaning all last week that they wanted to be in Boston for monday's fun. 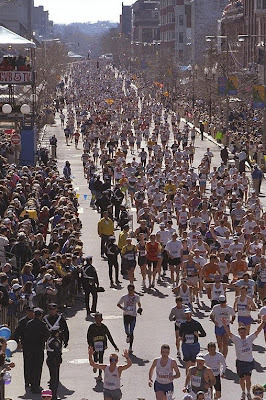 Enjoy your day and thanks for giving us a great view of the runners. Gina from Willow Decor is there also cheering from the sidelines and hopefully enjoying some good cheer with friends. What a great way to start the week you lucky Boston girls! I (for some crazy reason) wish I was there running! And then bbqin' and drinking after, of course! How fun! I knew a girl to run it last year.. I need to find out if she did again! Oops, meant hope you had fun!